After bringing the likes of Zedd, Marshmello and Borgore to heat up Toronto last December, organizers behind the annual Solaris Winter Music Festival have lifted the curtain on the lineup for their 2017 edition. The event's first day finds local dubstep heroes Zeds Dead atop the bill alongside Oliver Heldens, with Parker and Manzone & Strong rounding out the main room action. The "Noir" room will feature sets from NGHTMRE, Rickyxsan and Giddy. The second day will feature Steve Aoki and Slushii leading the main room madness alongside Bijou and Mark Oliver, while Ookay, Nvdes and Flipside will hold down the "Noir" room. 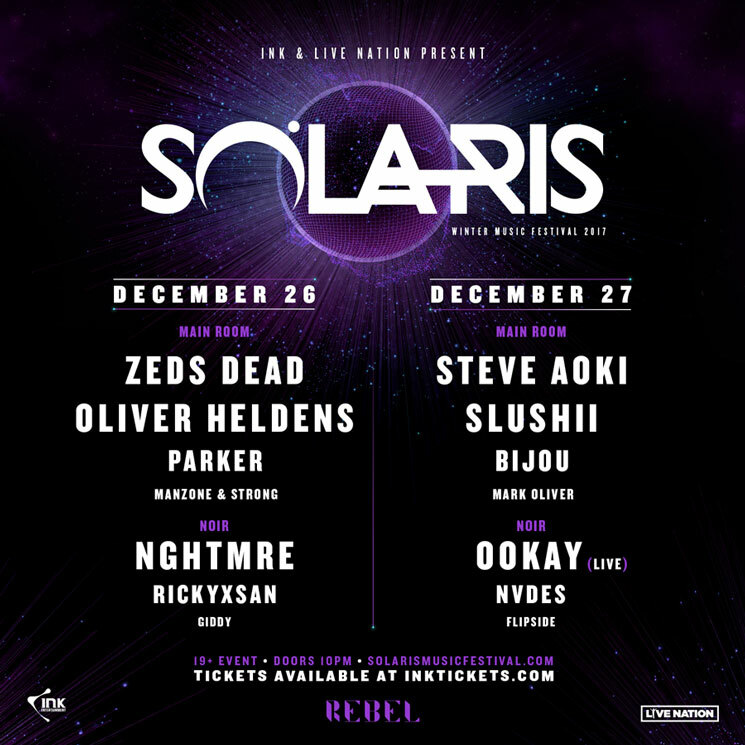 Solaris will take place in Toronto on December 26 and 27 at Rebel, with doors opening at 10 p.m. both evenings. Tickets for this year's event will go on sale November 21 at 10 a.m. local time and can be purchased here. Watch a video recap of last year's edition of Solaris in the player below.